The 18-hole Forest Hills Golf Club in Augusta, Georgia is a semi-private golf course that opened in 1926. Designed by Donald Ross, Forest Hills Golf Club measures 7140 yards from the longest tees and has a slope rating of 137 and a 74. Thousands of people pour into Augusta each year to attend the Masters, but there's more to the city than the first major championship of the golfing season. Augusta is the second-largest city in Georgia and has a rich tradition in the fields of medicine and the military. Augusta is home to the Georgia Health Sciences University (formerly the Medical College of Georgia), which has trained physicians since 1828. Along with the University Hospital, the medical field employs more than 25,000 and has an economic impact of $1.8 billion. There is a strong military presence with Fort Gordon, home of the U.S. Army Signal Center. Downtown Augusta has been revitalized partially because of development of Riverwalk Augusta, a riverfront park that runs along and on top of the city's levee. Augusta Canal has a bicycle and walking path and Aqueduct Park is a lagoon that has been converted into a park and swimming site. There are three professional sports teams in Augusta: the Augusta GreenJackets baseball team, the Augusta Riverhawks hockey team, and the Soul City Sirens roller derby team. Tickets to all sports are readily available. And while Augusta National is the most famous landmark in the city, visitors will hardly even know they're driving by one of the greatest golf courses in the world. Fences around the course are lined with green screens and there are few signs off Washington Road to indicate the presence of the course that Bobby Jones built. And, if you do find it, don't bother asking the guard at the entrance if you can drive down Magnolia Lane. It would be easier for you to talk your way into the Oval Office. There are, however, several golf courses in Augusta that are accessible to visitors, including Forest Hills Golf Club, established in 1926. 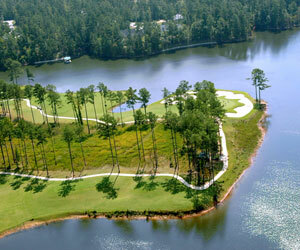 The course serves as home to the Augusta State men's golf team, which won the 2010 NCAA Championship. Goshen Plantation is an Ellis Maples design that has hosted many qualifiers and competitions for the Georgia State Golf Association. Jones Creek in suburban Evans is a Rees Jones design that is annual ranked as one of the best golf courses in the Augusta area; it was recently renovated by Tom Fazio. Augusta's climate is conducive to golf almost every month. There are a few cold snaps in the winter, though the summer heat and humidity can be oppressive. While you're taking in all the action during Masters Week, you too can tee up in the heart of historic Augusta at Forest Hills Golf Club -- a subtle, challenging Donald Ross course. There are several other worthy courses to consider as well, including the River Club, Bartram Trail and Champions Retreat. The view out the back window of the pro shop at Pointe South Golf Club in Augusta gives a visitor the wrong first impression. But once you get out on the course, Pointe South is filled with rolling hills, leaving you with enough uphill and downhill shots to keep things interesting. The course is hardly boring. Plus, it's a course that anyone -- low or high handicap players -- can appreciate. Attention: Good golf at Fort Gordon near Augusta, Ga. Assuming you don't have any explosive devices, enriched uranium or Osama bin Laden hiding in your trunk, you can make it through the security checkpoint at Fort Gordon near Augusta and play Gordon Lakes Golf Course. Even if you're not a soldier. The Goshen Plantation Golf Club claims to have the best greens of any golf course in Augusta, Ga. outside of Augusta National. The greens are, indeed, special. They are big, averaging 8,000 square feet, sloped, undulating and in near-perfect shape. Bartram Trail Golf Club in Evans, Georgia has a nice, rural feel, with none of the homes that tend to mar golf course landscapes these days. The course makes use of the rolling terrain with hardwood and pine forests. You would have expected nothing less from a course named after the famous naturalist, William Bartram, who cataloged native flora as he hiked around the Southeast in the late 1700s. They take their nature seriously here in the lower Piedmont and upper sand hills. The practice greens at Goshen Plantation Golf Club in Augusta, Ga. are sloped, undulating and in immaculate shape, a harbinger of things to come once you get out on the course. Inevitably, they are compared to the greens of their neighbor, the most famous golf course in America. Mount Vintage Golf Course in Augusta, Georgia used to be a hotbed of duelers, but now the only dueling is between the golfers and the course, which winds up, down and through the hills of the old plantation. There is considerable elevation change here, but your main challenge will be the greens. Jones Creek Golf Club, one of the courses in and around Augusta and the hallowed grounds of Augusta National in Georgia, was designed by Rees Jones. The course then went through several ownership changes, suffering through various stages of neglect. Finally, a group of mostly local investors decided to restore it to its former glory, calling in Tom Fazio to finish the job. The River Golf Club in North August, South Carolinais one of those admirable golf courses risen - literally - from the rubbish heap. It sits on the site of an abandoned railroad yard and former illegal dump, a 5-iron over the Savannah River from Augusta, Ga. There are no sign of garbage or trash, though; the little course is a picturesque gem.